Definition at line 116 of file locale.c. Definition at line 105 of file locale.c. Definition at line 104 of file locale.c. Definition at line 103 of file locale.c. Definition at line 43 of file locale.c. Definition at line 27 of file locale.c. Definition at line 28 of file locale.c. Definition at line 47 of file locale.c. Definition at line 46 of file locale.c. Definition at line 117 of file locale.c. Definition at line 44 of file locale.c. Definition at line 627 of file locale.c. Definition at line 635 of file locale.c. Definition at line 619 of file locale.c. Definition at line 1481 of file locale.c. Definition at line 1490 of file locale.c. Definition at line 537 of file locale.c. Definition at line 549 of file locale.c. Definition at line 561 of file locale.c. Definition at line 589 of file locale.c. Definition at line 510 of file locale.c. Definition at line 525 of file locale.c. Definition at line 1496 of file locale.c. Definition at line 609 of file locale.c. Definition at line 1518 of file locale.c. Definition at line 1523 of file locale.c. Definition at line 1424 of file locale.c. Definition at line 417 of file locale.c. Definition at line 450 of file locale.c. Definition at line 483 of file locale.c. Definition at line 403 of file locale.c. Referenced by MSVCRT__create_locale(), and MSVCRT_locale_to_LCID(). Definition at line 120 of file locale.c. Referenced by ddraw_match_surface_desc(), and find_best_locale_proc(). Definition at line 374 of file locale.c. Definition at line 141 of file locale.c. Definition at line 641 of file locale.c. 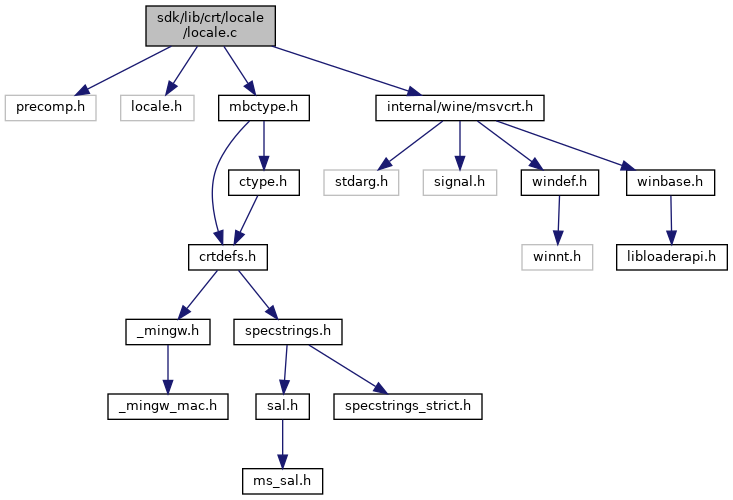 Referenced by _configthreadlocale(), and MSVCRT__free_locale(). Definition at line 685 of file locale.c. Definition at line 354 of file locale.c. Referenced by ___lc_collate_cp_func(), __p__pctype(), __pctype_func(), _Getdays(), _Getmonths(), _Gettnames(), localeconv(), MSVCRT__get_current_locale(), MSVCRT_btowc(), and setlocale(). Definition at line 364 of file locale.c. Referenced by __p__mbctype(), _getmbcp(), _ismbbkalnum(), _ismbbkana(), _ismbblead(), _ismbbpunct(), _ismbbtrail(), _ismbchira(), _ismbckata(), _mbbtombc(), _mbcjistojms(), _mbcjmstojis(), _mbctombb(), _mbsnbcpy(), _mbsnbcpy_s(), _mbsncpy(), _setmbcp_l(), and MSVCRT__get_current_locale(). Definition at line 601 of file locale.c. Referenced by ftoes(), and ftofs(). Definition at line 722 of file locale.c. Referenced by __init_global_locale(), _configthreadlocale(), and setlocale(). Definition at line 711 of file locale.c. Referenced by DllMain(), MSVCRT__create_locale(), and setlocale(). Definition at line 697 of file locale.c. Definition at line 571 of file locale.c. Definition at line 208 of file locale.c. Definition at line 88 of file locale.c. Definition at line 1277 of file locale.c. Referenced by _configthreadlocale(), test___mb_cur_max_func(), test__Gettnames(), and test_setlocale(). Definition at line 345 of file locale.c. Definition at line 289 of file locale.c. Definition at line 34 of file locale.c. Referenced by ___lc_codepage_func(), __init_global_locale(), and setlocale(). Definition at line 37 of file locale.c. Referenced by __init_global_locale(), and setlocale(). Definition at line 16 of file environ.c. Definition at line 17 of file environ.c. Definition at line 50 of file locale.c. Definition at line 40 of file locale.c. Definition at line 38 of file locale.c. Definition at line 1495 of file locale.c. Referenced by __get_MSVCRT_locale(), __init_global_locale(), _setmbcp_l(), and DllMain(). Definition at line 35 of file locale.c. Definition at line 36 of file locale.c. Referenced by ___lc_handle_func(), __init_global_locale(), and setlocale().